Posted by The MyHome Newsdesk	in Mortgages & Money, Property News	with 10 Comments on The banking crisis blame game: Will any one be held accountable? However as stated in the papers although there is sufficient detail in these reports to establish what went wrong and why in traditional Irish fashion fault however has still not been laid specifically on the shoulders of individuals and also show that those responsible for the crisis still hold positions of trust. Will any one be held accountable? People, I’m afraid to throw even more cynical wood on the fire but C’MON, this is Ireland! A nation that revels in the liking of gangsters like Charlie Haughey, the “alleged” bad boys like Bertie Ahern, sympathise with the brown envelope gang in saying “well if they didn’t take them, someone else would”… What bloody hope in hell do we have of seeing an independant, open and honest inquiry into this, never mind seeing those responsible brought to justice. We all watch Prime Time, we’ve all seen that the heads in Iceland have already rolled and they didn’t need big boys with clout in the elite of world economics coming in with reports. They did their own, honest and open and their banking inquiry is done and those responsible losing their jobs. What have we here? Two seperate reports saying our problem was home grown and a taoiseacht still implying it was outside sources in the world financial markets that caused our meltdown only 12 hours later!!! No one will be held accountable. Some may be made to apply for bankrupcy but they’ll have already transferred all their assets into their family members accounts. One or two low profile members may even goto jail. (For a month because jails are full of people that don’t pay their TV licence or credit union loans so they won’t have the space for bankers!) We could demand it but how many of you here will actually walk out of their jobs on a Monday morning for a few hours and fill every street, every side street outside Leinster House and demand what we want from the people WE elect to serve OUR interests! As long as we keep taking it, they’ll keep dishing it out. Banana republics do not have the wherewithall or nouse to diagnose the inherent problems in a corrupt society. The recovery will not materialise in Ireland until 2025 at the earliest, substantially later the rest of the Western economies. 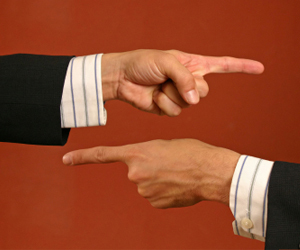 Who should be held accountable? The people in charge, duh. How difficult is it? It’s clear that some of the banking crisis came from outside factors, but blaming outside factors alone is not credible. Put a percentage on it, if you have to, but internal factors added fuel to the fire, and the people in charge are responsible. Stop defending the indefensible, grow a pair and admit that it’s your fault. We’ll still have to pay for it, it won’t make us feel any better, you won’t get any more respect from us, but as a bare minimum you will have accepted responsibility for the things you didn’t do at the time. We live in a country where people can die from contaminated blood, but the management who oversee that can be pensioned off rather than fired. So, it’s not a big leap that the people who “regulated” the banking system (appointed by the Government of the day) can be pensioned off and disappear to a golf course. And the people who appointed them can be pensioned off while still working as TDs and ministers in the Dail. And some will lose their jobs as TDs in the next election, and “retire” back to their teaching jobs. And serving TDs and senators can play golf in Turkey rather than do the job that they are paid and pensioned to do. Actually, I shouldn’t say “serving” senators, they’re not serving anybody. And some of these same fine body can claim thousands and thousands in expenses for commuting from where they aren’t living – this long after a political bloodbath in the UK following something similar there. And people who “ran” the banks and borrowed money they now can’t afford to pay back will not be prosecuted (about the only thing their pensions would not pay for) – their former colleagues who worked and managed with them are now in charge, and can pay themselves extra pensions and bonuses because their contract says so. I’m sure I missed a few things, but that’s enough to be going on with. However, everything is fine, now; even though no-one accepts responsibility, they’re all prepared to “go the distance” and actually make decisions from now on for the good of the country. Apart from wondering how much mileage they’ll be claiming for going that distance, I wait with baited breath. I certainly hope so, this problem was seen by the public coming a long way off, anyone who had half a brain seen it coming and the govt ignored anyone who spoke about it, continued to fuel the fire. Yes I think specific people should be held accountable. The are trusted with the job, and to do so in a professional and informed way, which they quite clearly didnt. enough to simply resign when you f up!! If they govt need to follow this through if the public is to have any trust in them in the future. Yes, some journalist will be sent to jail for not disclosing sources. Greedy Bankers and the Government that allowed them to get away with doing what they did. Both should be held accountable but they won’t. As long as we don’t have another “waste of money” tribunal and waste more of our hard earned money. The government, particularly Brian Cowen,the regulator and the bank hierarchies SHOULD be held accountable. But no-one WILL be held accountable. The only person who would have, would have been the regulator, but he has already gone. The only people who will pay for this mess will be the tax payer. The government will remain thick necked until 2012 because they know if they do the decent thing and call an election, the majority of them will be unemployed. And all FF care about is being in power. Ditto for the greens and those ‘brown envelope’ independents who keep them in power. I think the Banks have been to encouraging towards the higher earners. No chance for the unemployed or small earners to own a home. Brian Cowen and Bertie Ahern drove this country into the ground by playing popular politics.